Congratulations to new Fremont Arts Council (FAC) board members. FAC offers spring events and updates. Come out the Fremont Sunday Market and celebrate Earth Day with us the way we party best – with a flash parade! Neon Brass Party is leading the pack again, so wear your dancing shoes. 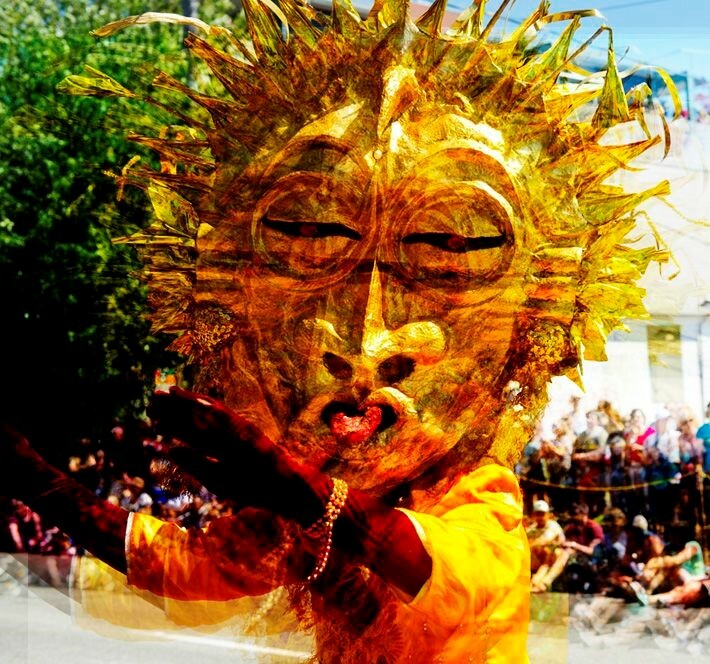 This is a great chance to try out your Fremont Solstice Parade ideas (on a small scale), or raid our costume bins and create an ensemble for this people-powered party! We’ll meet at our booth (near the West end) at Noon and roll out at 1pm! Congratulations and welcome! to our new board members: Darcy Gabriele, Brigette LaGarde and Asia Casebolt. They are joining forces with these returning board members: Farley Harding, Ennie Brosius, Linda Greenway, Maque DaVis, and Sarah Lovett. A big round of thanks to outgoing board members Susan Harper and Balou De la Rosa. Heartfelt appreciation to all for your gift of service to our community. Will you be in the parade? Plans are percolating. Tell us about your parade ensemble ideas! Are you interested in performing at the celebration at gasworks? We would love to hear from you! Please fill out our musician/performer application to tell us more. This month: We’ll make springtime flower crowns and dream up ideas for our 30th Fremont Solstice Parade. Please join us at our monthly COW meeting. This is where we come together as a community and dream up what’s next. Share ideas and one minute announcements of interest to our community. Meet and Greet and Eat snacks. Find out what the FAC is up to and how you can get involved. Meet at the Powerhouse, 3940 Fremont Ave. N., Seattle.